This up-to-date, comprehensive and consolidated guideline on essential intrapartum care brings together new and existing WHO recommendations that, when delivered as a package, will ensure good-quality and evidence-based care irrespective of the setting or level of health care. The recommendations presented in this guideline are neither country nor region specific and acknowledge the variations that exist globally as to the level of available health services within and between countries. The guideline highlights the importance of woman-centred care to optimize the experience of labour and childbirth for women and their babies through a holistic, human rights-based approach. 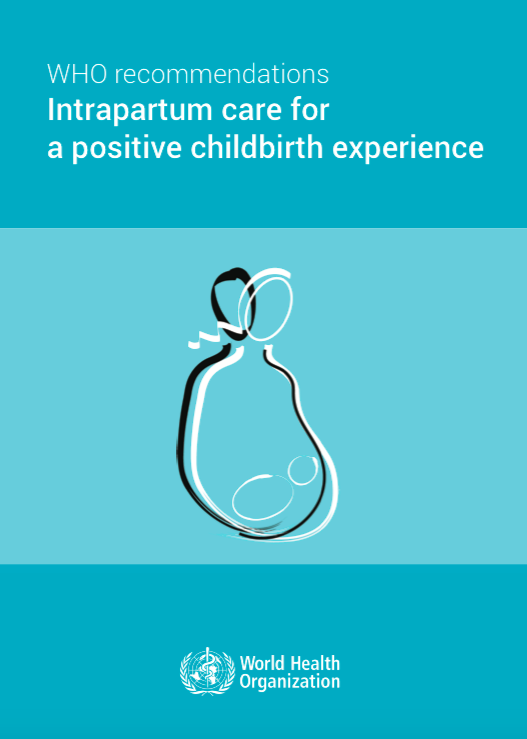 It introduces a global model of intrapartum care, which takes into account the complexity and diverse nature of prevailing models of care and contemporary practice. The recommendations in this guideline are intended to inform the development of relevant national- and local-level health policies and clinical protocols. Therefore, the target audience includes national and local public health policy-makers, implementers and managers of maternal and child health programmes, health care facility managers, nongovernmental organizations (NGOs), professional societies involved in the planning and management of maternal and child health services, health care professionals (including nurses, midwives, general medical practitioners and obstetricians) and academic staff involved in training health care professionals.